Kuhlman and his dog Apollo attend the annual "Blessing of the Pets" service at Christ United Methodist Church in Bethel Park, Pa. UMNS photos by Clay Kisker. Siesta the sloth made history recently at First United Methodist Church, Tacoma, Wash. The occasion was the annual blessing of the animals. While lions and tigers and bears (oh, my!) never step foot in a church, it is not unusual for dogs and cats—and an occasional snake, parrot or hamster—to make the trek. Often in churches across the United Methodist connection, the pet blessing service coincides with the Oct. 4 feast of St. Francis of Assisi, the patron saint of animals. While the Book of Worship recommends the churchyard or a park as the ideal venue for blessing domestic pets and other animals, plenty of congregations open their sanctuaries to their favorite two-, four- and no-legged friends. At Tacoma’s First Church, Siesta the sloth—an exotic mammal from Point Defiance Zoo and Aquarium—joined her less headline-making contemporaries for the service. “We are here to harmonize our lives with the lives of all creation,” the Rev. Melvin Woodworth said, urging the congregation to respect and honor animals. The congregation sang “All Things Bright and Beautiful,” with the many critters in the church barking and meowing in accompaniment. Blessing of the Pets service at Christ United Methodist Church in Bethel Park, Pa.
Sara Mattison, a staff biologist at the zoo, brought Siesta to the ceremony. A 10-year-old two-toed sloth, Siesta hung onto Mattison as if she were a tree. Native to South American rain forests, sloths spend most their lives hanging in trees, Mattison explained. Woodworth began the blessing ceremony with Siesta, laying his hands on the sloth’s head and asking God to bestow good health upon her. The parishioners then lined up with their pets for a blessing. About 50 people and their pets attended the event last year, according to Debbie Golden, director of evangelism and church membership. 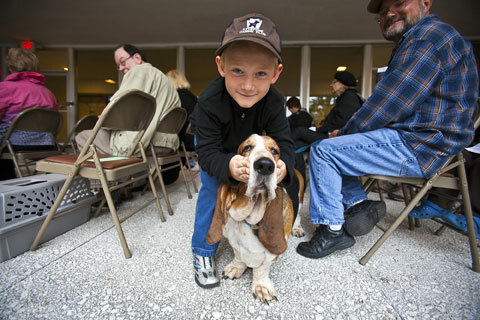 In Miami Beach, Fla., well-behaved pets and their human companions of all faiths are welcome at the pet-blessing service at St. John’s on the Lake United Methodist Church. After the service, members host a “yappy hour” on the church’s outdoor patio. “We added dog adoption to this year’s service because there are many animals in our community that are deserving of a loving home,” said the Rev. Christopher McNeill. “How blessed would these orphans be if they got adopted at a pet-blessing service. 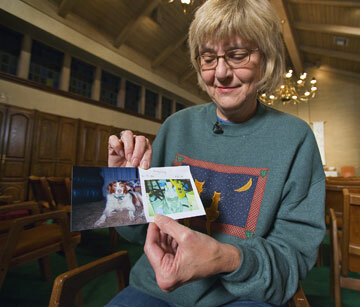 Judy Dixon brings photos of deceased pets to the memorial service organized by the "Hearts and Paws" ministry. Leslie Denton brought her dog Theodore to Christ Church for therapy-dog testing. “I think it’s a good way for (the pets) to get together and meet other Christian dogs and owners,” Denton said with a laugh. Denton and Theodore are joining Therapy Dog International. Through the organization, pets learn to reach out to people in hospitals, nursing homes and elementary schools. 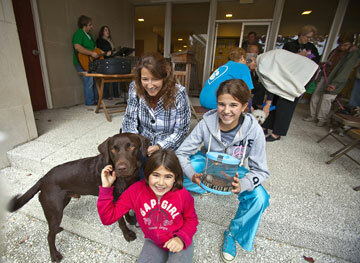 The “Hearts and Paws” ministry is committed to people and their pets year-round. It started as an emergency pet-sitting service for church members and blossomed into pet therapy, adoption fairs, free pet food, a pet prayer hotline and pet memorial services. For some people, the pet ministry is their first contact with the church. “We may not be different,” Hirsch said, “but we’re focusing on something that’s their particular need. Christ UMC, Bethel Park, Pa.
St. John’s on the Lake UMC, Miami Beach, Fla.